On April 4, 1968, Bobby Kennedy was traveling from Muncie to Indianapolis when he was informed of the shooting. Against the advice of police and even his own staff, Kennedy spoke to the crowd at a park in a largely African American neighborhood. His appeal to the crowd to respond to the killing with the example of non-violence that King modeled is believed to be one of the primary reasons Indianapolis did not see the violence that many other cities across the country experienced that night. Ethel Kennedy and her son, Max, appeared at Martin Luther King, Jr., Park in Indianapolis for a commemoration of both events. President Trump Tuesday signed a bill into law that designates the site, now known as Kennedy-King Park, a National Commemorative Site. U.S. Rep. John Lewis (D-Ga.), a campaign aide to Robert Kennedy in 1968, and Kennedy's daughter, Kerry, were among those in Indianapolis Wednesday to commemorate the 50th anniversary of King's assassination and Kennedy's speech. It was the first time Lewis had visited the site since 1968. Ten years ago, Max Kennedy downplayed his father’s role in quelling the violence in Indianapolis that night in 1968. The two Kennedys were campaigning for Obama, then a freshman Senator from Illinois, who was competing against New York Senator Hillary Clinton for Indiana’s 72 delegates in the May 6, 2008, Indiana primary. “He’s a breath of fresh air. 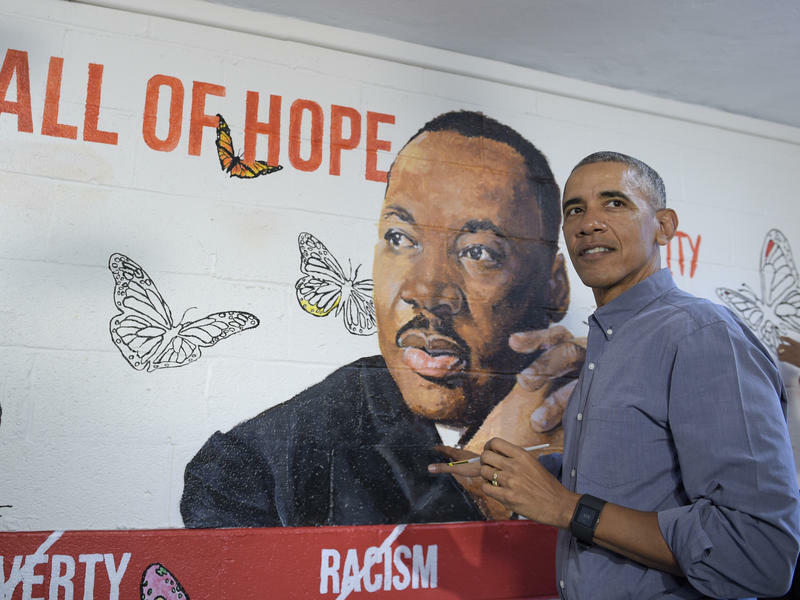 Our country has kind of lost its moorings and he is so centered and so courageous and he knows who he is and nobody’s going to move that rock,” Mrs. Kennedy said when asked if there was something about Sen. Obama that reminded her of her late husband. Ethel and Max Kennedy continued their campaign for Obama in South Bend the next day with an appearance at the West Side Democratic Club. 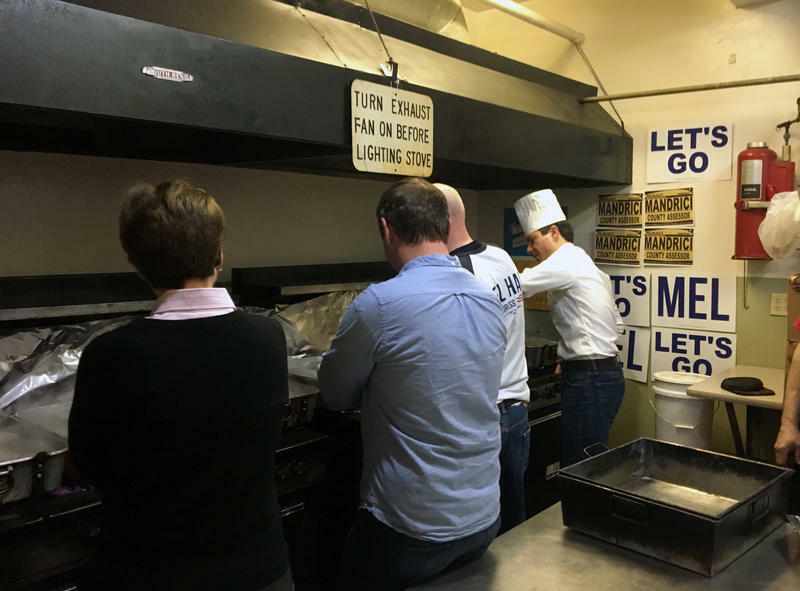 Less than two weeks earlier, another member of Robert F. Kennedy's family campaigned in South Bend for Obama's Democratic rival, Hillary Clinton. Maryland Lt. Gov. Kathleen Kennedy Townsend appeared with former President Bill Clinton, along with daughter Chelsea Clinton, at the West Side Democratic Club for Dyngus Day celebrations. Memories of Kennedy's 1968 Dyngus Day appearance were invoked at both Kennedy family appearances on behalf of both of the 2008 Democratic candidates. "I have two buttons on," said former Indiana Congressman Tim Roemer. "I have a Barack Obama button on... and I have a Robert Kennedy button on from 1968!" Former President Clinton spoke of the support his wife received from Kennedy Townsend and her brother, Robert Kennedy, Jr.
“Hillary holds Senator Kennedy’s seat in the United States Senate from New York; and they basically said they consider her to be his heir, because she had spent a lifetime as a change agent for other people,” Clinton said. Then-Indiana House Speaker Pat Bauer was asked if this was something he's seen since '68. Bauer said, "No, this like '68." Hillary Clinton and Barack Obama would make several appearances in Indiana over the next month. Obama won the Indiana primary and, ultimately, the Democratic presidential nomination before becoming the first African-American elected President of the United States. 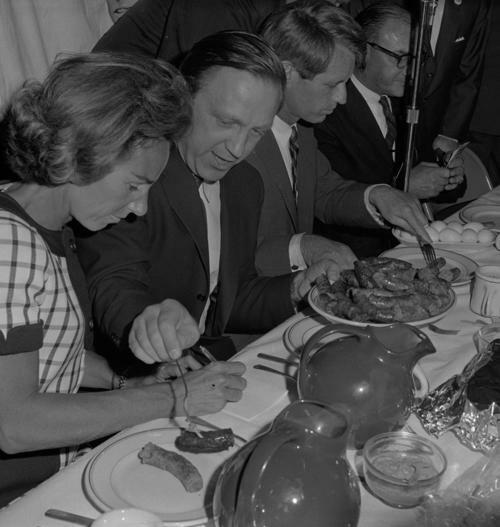 On Dyngus Day in April 1968 at the West Side Democratic & Civic Club in South Bend, U.S. Rep. John Brademas, center, serves kielbasa to Ethel Kennedy, left, wife of Sen. Robert F. Kennedy, right, who was a Democratic candidate for president. Courtesy of Michael G. Gotsch Jr.
Monday is Dyngus Day, a Polish celebration of the end of Lent and, in Northern Indiana, a big deal in political circles. 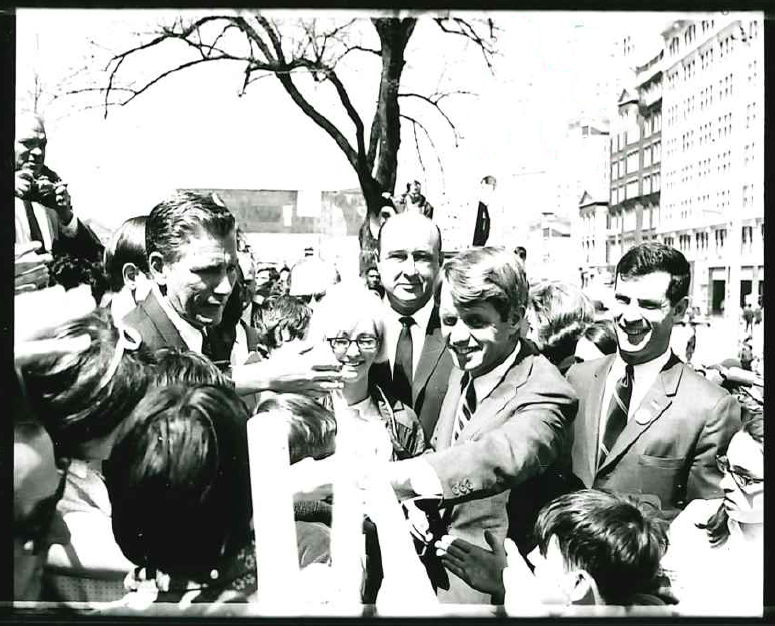 Fifty years ago South Bend experienced one of it’s biggest Dyngus Day events when Senator Robert Kennedy visited while campaigning for the Indiana Democratic presidential primary. Indiana was a must-win for Bobby Kennedy in 1968. Lyndon Johnson had just announced he would not run and Kennedy was too late for early primaries. Indiana was his first chance to prove he could get votes. 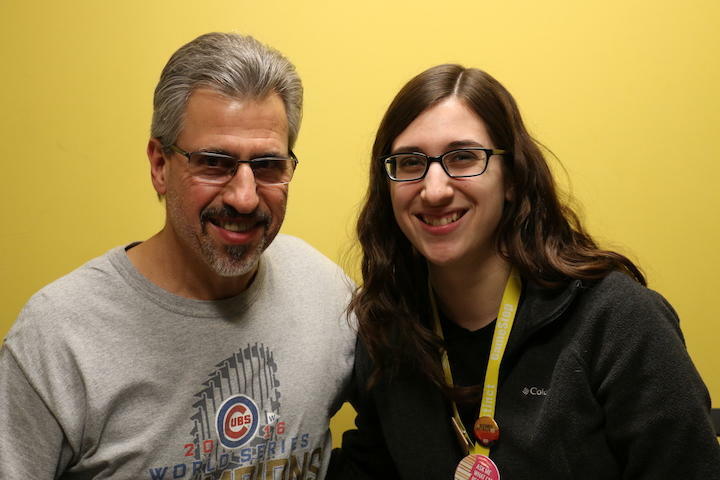 In this debut of Michiana Stories, Polka musician Kenny Bartkowiak shares memories of music and Dyngus Day in South Bend with his daughter, Amy. Michiana Stories is a production of the St. Joseph County Public Library and 88.1 WVPE and airs Mondays at 7:45 AM during Morning Edition and at 4:45 PM during All Things Considered. Politicians and voters are celebrating Dyngus Day. The Polish celebration of the end of lent is also a big political holiday, particularly in South Bend. Dyngus Day in South Bend started in 1930 at the West Side Democratic Club. Back then the neighborhood was largely Polish, now it’s mostly populated by people of color.